The Laser Boutique | Sea Point, Cape Town / Gee Whiskers! The Friday before I got married last year, I visited the recently opened The Laser Boutique in Sea Point, Cape Town. I was invited to try out two treatments and to tour the facilities. My Mom and I went together on the day - I had a Shellac manicure and my Mom had a RégimA facial. 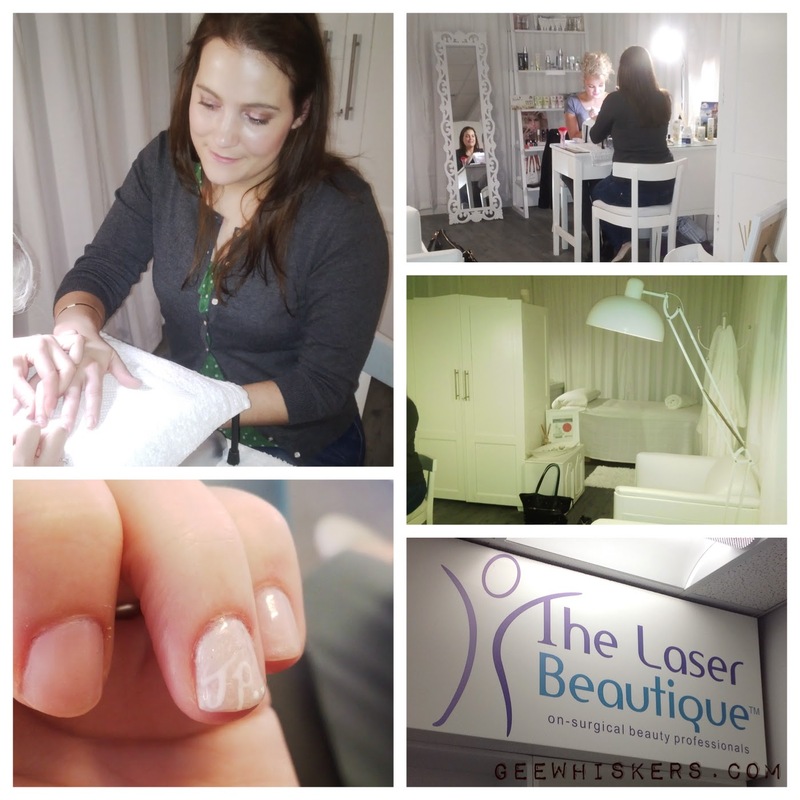 Firstly, The Laser Boutique has franchises in the Joburg / Pretoria area and a boutique in Sea Point, Cape Town. The Sea Point franchise is housed in the Buc Fitness Centre which makes this the ideal location for people who want a complete body solution - fitness and beauty. The Laser Boutique is housed upstairs so you do have some privacy and separation from the busy gym. I found the treatment rooms to be very modern, airy and kept spotlessly clean. As mentioned I decided to have a shellac manicure done because I wanted a manicure that would last for my Wedding Day as well as for the week long honeymoon that followed. Teresa, my therapist, was so patient with me when it came to deciding on a colour and came up with such nice ideas to incorporate some personal touches. We decided on a very natural nail colour with my two ring fingers having a bit of shimmer in them as accent nails. While we were busy we were thinking of what else we could do and I decided I wanted to have JP's name on my wedding ring finger. I really loved this touch and JP too, also really loved the gesture of it. I really love Shellec - it is much thinner than Gelish and looks far more natural on the nail bed. It also feels lighter on the nail because each layer is the same thickness as traditional nail polish. My Shellac lasted a good 2 weeks where I was not gentle on my manicure at all. Removing the Shellac was also a much quicker process when compared to my Gelish experience and I suffered far less nail damage during the removal process. So I am very impressed with Shellac. After my manicure, we went to a RégimA room to have the facial done on my Mom. I wasn't brave enough to try out new facial products so soon to my wedding day. We also decided my Mom would have it so that we could best see the results of this intensive anti-ageing and rejuvenating facial. This isn't just a facial, it is a facial peel that removes the top layers of dead skin and then the remaining products pump up the skin, with immediately visible results. Both my Mom and I couldn't believe the results from only 1 treatment. You can see them for yourself in the photos above (if you click on the photo it will show a bigger image). The lines around my Mom's mouth and eyes were noticeably less deep and a few of the finer lines disappeared entirely. The effects of this lasted about 1 week without using the RégimA range of products. The effects of the facial would last much longer when following a proper RégimA regime every day. Overall, I can definitely recommend The Laser Boutique for treatments and even though I haven't tried any of their laser treatments, I heard great things about it. My Mom is currently going for a course of treatments to remove unwanted hair - if anyone is interested in hearing about this, pop me an email or leave a comment below. There are so many different laser treatments available, far too many to cover in a blog post, I suggest visiting The Laser Boutique website to get all the information you need. RégimA is the most advanced, medically accepted, skin care programme created to attack the ageing free radicals and toxins associated with modern living. These elements are responsible for most of the skin's visible signs of ageing, including loss of skin tone and wrinkles. 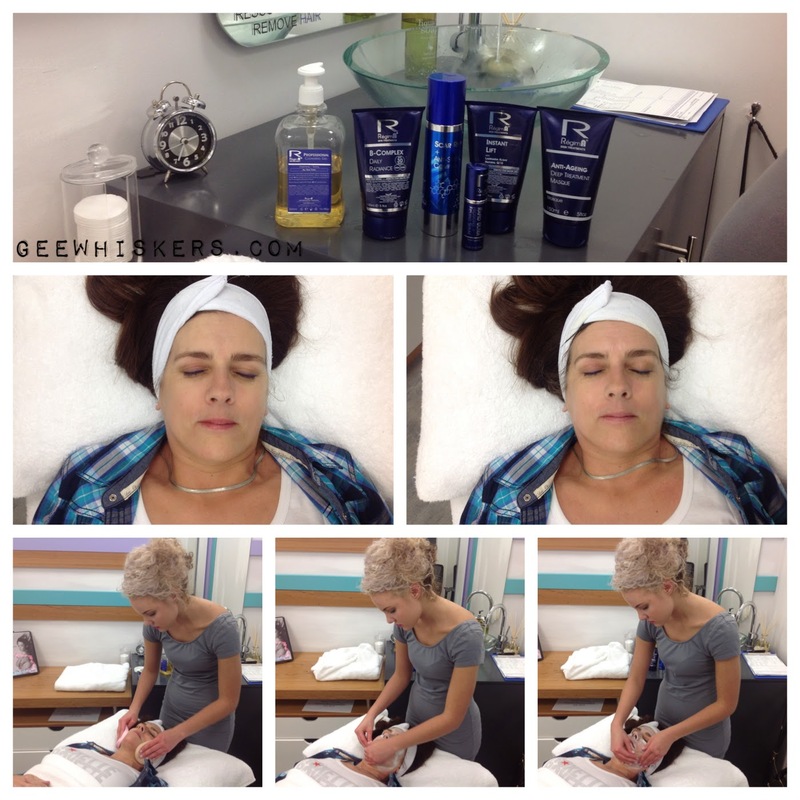 Without the help of RégimA's technology these toxins will surely cause premature ageing. Years of scientific research have culminated in this ultimate regime, which is simplicity itself. RégimA is a cosmeceutical product that was formulated in South African laboratories. The experts and processes relied on the best possible medical knowledge as well as an intimate knowledge of the South African weather and other conditions influencing your skin and your skin's reaction to these conditions. Treatments offer undeniable results anchored in a unique formulation that removes the outer layer of dead skin (literally "peeling" it) while stimulating collagen production (literally "healing" it) at the same time. The Laser Beautique specialises in 20%, 40%, 70% and acne facial peel and heal treatments as well as full body and slimming peel treatments. These non-surgical procedures are so safe and non-invasive that they can be done at the height of our South African summer. Sounds like such a pamper! !